October 2 was a very historic day for the second time with respect to football at Dal. Ted Wickwire was a star football player for Dal in the late 50s/early 60s. Mr. Wickwire graduated from Dal with his LL.B. in 1962, and 14 years later in 1976 the football program at Dal ended. Seventeen years later, on October 2, 1993 in honor of Mr. Wickwire’s achievements and in recognition of his outstanding contributions to Dalhousie University, the playing field, the scene of many of his triumphs, was hereby named The F.B. Wickwire Memorial Field. 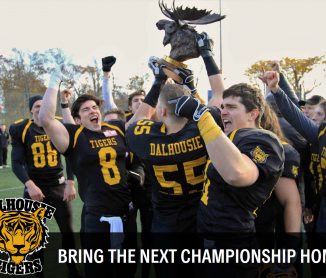 On October 2, 2010 – exactly 17 years to the day – the new Dalhousie Football Club played their first home game on the F.B. “Ted” Wickwire Memorial Field – the first football game played on the field since its dedication on October 2, 1993. Members of the Wickwire family were on hand for the ceremonial kick off.